Finns would rather sit naked in a hot room than have a conversation, but if you do happen to talk to a Finnish person, expect brief to-the-point answers and silence. Don’t try to fill the silence with small talk, it will only make things worse. Unless it’s about the weather, then go right ahead. By the way, it’s raining while I’m writing this and it’s forecasted that tomorrow is going to rain too. The weekend is supposed to be nice though. I should also mention that “summer” doesn’t last very long and Finnish people love to complain about it. Before the warm days people complain that it’s too cold and during warm days they complain that it’s too hot. 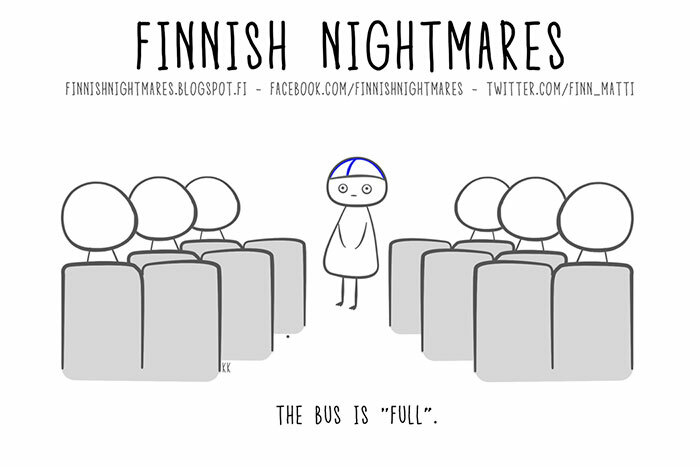 Moving on to personal space, something that is very important to Finns. We like to keep our distance from other people. For example, in public transport, people prefer to sit alone and avoid sitting next to someone they don’t know and would rather stand. If you want to mess with people, sit next to a stranger and start a conversation, see how they react. Nothing confuses a Finn more than a strange person initiating conversation. All of this is thrown out the window when alcohol is introduced into the equation. Offer a Finnish person a drink and you’ve made a friend for life. Alcohol is a big part of the Finnish culture, for better or for worse. These stereotypes might give the image that all Finns are quite reserved, shy and like to be alone and for the most part, stereotypes are based on reality. However, once you get to know Finnish people you’ll find out that they are one of the warmest, most loyal and sincere people you’ll ever meet, even though they might not want to portray that picture of themselves.